Usually to seafood served with white wine. But and flavors of this wine, and seafood is so much that could easily get lost. Seafood provides a lot of room for experiments with a solar drink. A sign of good tone is the selection of wines from the product subject to the prescription food. Most sommeliers will insist on the filing of this dry white wine to the dishes of inhabitants of the deep sea. This is because it is most successfully emphasizes the taste of any seafood. But there may be variations. What requirements must be placed on the drink? It needs to be young and fresh, light and savory, the flow temperature can range 9-16 degrees, without any noble pronounced flavors, including cask. That is, the wine should be fine, but neutral, without sharp aroma and taste. When choosing wine, it is advisable to ask in advance what ingredients are in meals. Often lobster or shrimp cooks complement the delicious sauces on the basis of sherry or spicy garlic. And the first and second can neutralize the taste characteristics of the drink to the dish. If seafood is added, for example, curry and spices, then you should refrain from choosing semidry and semisweet white. If the filling is present the tomato or cheese, preference can be given deeper and more intense white and rose wines. What fine wines are suitable to the specific gifts of the sea? Shellfish differ iodide "sea" flavor, they are buttery and salty, which requires a white wine with a pronounced sour flavor. So, for oysters , you can file a French Chablis, Sancerre, dry German Riesling, Australian Semillon. Almost a win-win – dry Muscadet. In combination with the deep seafood it is suitable for the first case, as the grape is characterized by moderate natural acidity and grows only in soils situated close to the sea and rich in iodine. A good option for oysters can be a classic dry sparkling wine Brut nature and Brut zero. Unusual, but very successful experiment will become dry Fino de Jerez. Do not ignore such a versatile wine, like Chardonnay, Sauvignon Blanc and white Bordeaux. 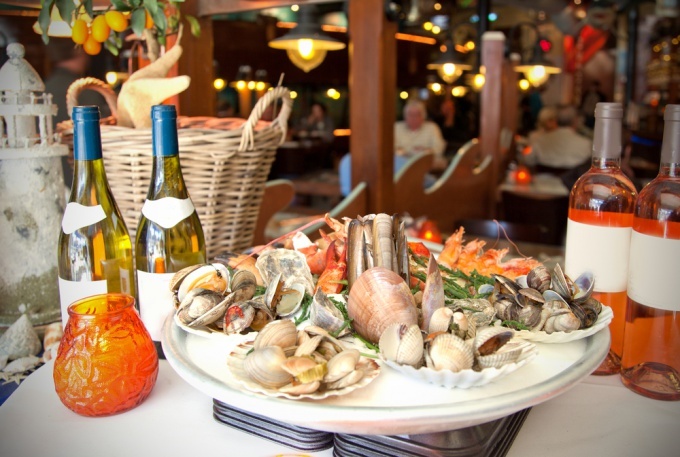 The mussels and octopus cooked with cheese, garlic sauce and tomatoes, you can choose pink côtes de Provence. If the sauce dominated by tomato and chilli, make a choice in favor of a young red côte-du-rhône. Pinot Grigio, Chenin Blanc and Sauvignon Blanc to mussels and shrimp are best suited. They are dry, with subtle notes of fruit and clear acidity. Good "sound" with seafood less restrained taste of the Greek assyrtiko and Italian Vermentino with aromas of herbs and ripe peaches. Crustaceans differ from the relatives of sweet white meat with a creamy taste. Boiled crayfish will open up with a semi-dry Riesling. Marine crustaceans – shrimp, lobsters, langoustines and lobster – the best "play" the taste is not too heavy Chardonnay wines, and wines of Burgundy. Crab is traditionally served with Sunny fruit drink, such as Austrian grüner Veltliner and Vouvray from the Loire valley. Aristocratic white sparkling Brut champagne flawless suited to the aristocracy of the sea – lobsters, langoustines, lobster. Will not spoil crustaceans and sparkling Spanish cava, and champagne Blanc de Blancs. Pink wine may well be replaced in conjunction with the inhabitants of the sea white Chardonnay and Blanc. Them unquestionably can be served with soups, pies, pale, risotto and pasta seafood. To the last dish is suitable, in particular, and red wine, such as Valpolicella or Beaujolais-villages. When compiling menus it is important not to be mistaken with the wine. If it will dominate the taste of seafood, the food will become a snack to alcoholic beverage, meaning you will drink wine and to eat. If there is the other extreme – the taste of the food will be much brighter than wine, it turns out only to eat and drink. A professional sommelier is recommended to avoid extremes, to fully enjoy both components of dinner and wine, and seafood.